Orbis Bloodstock has announced its Snitzel 2yo stakes winner Ducimus will cover his first book at Rivercrest Park Stud in WA this year. The news comes just days after Snitzel landed the Magic Millions 2YO Classic with Exhilarates. Australia’s reigning champion sire has banked $16.11 million in prizemoney this season and will be favoured to defend his title with a growing margin to second-placed I Am Invincible ($9.52 million). 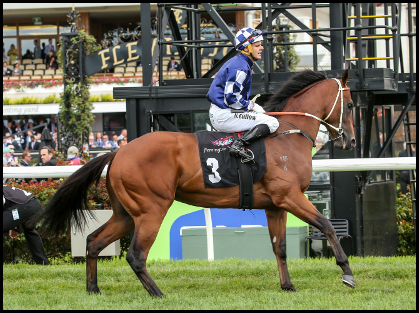 Ducimus created a milestone for Snitzel and a black-type first for Orbis Bloodstock when he won the LR Talindert Stakes (1100m) at Flemington in February 2017. He was the 50th individual stakes winner by Snitzel and that total had increased to 87 by the time Exhilarates blitzed a red-hot field at the Gold Coast on Saturday. Ducimus was a star turn from the outset with Team Hawkes forced to bid a sale-high $700,000 at the 2016 Inglis Melbourne Premier on behalf of Orbis Bloodstock owner Little Kwok Hing Hung. He was ready to roll as a summer juvenile and opened his account on debut at Ballarat. Sent straight to the front by Noel Callow, he was a couple of classes above them in the Bartlett 2YO Plate (1100m). Elevated straight to the LR Talindert Stakes (1100m) at Flemington, he was still too good against much tougher opposition after firming from $9 into $4.60 favouritism. Connections decided to roll the dice in Sydney for the G2 Pago Pago Stakes at Rosehill. He was joined in front by Single Bullet and they broke clear for a two-horse war with the winner guaranteed a spot in the Golden Slipper a week later. Snitzel colt Time For War won the 2014 Pago Pago but his stud career was cut short after two books in the Hunter Valley. His unbeaten first-crop colt Time to Reign on the third-line of betting at $15 for this year’s Golden Slipper. Team Hawkes filly Estijaab won last year’s Golden Slipper which propelled Snitzel to the Australian 2YO title as well at the overall Australian premiership. And his son Sizzling finishing third on the freshman ladder behind Zoustar and Spirit of Boom. Ducimus is the 8th foal and 8th winner for Beauty World (Danehill Dancer) and her other stakes winners include Hi World (G3 ATC Frank Packer Plate), Lite’n In My Veins (G3 WATC Northerly Stakes) and Loveyamadly (LR MVRC Abell Stakes). But the dominant feature of his pedigree is a powerful 3m x 3m cross of breed-shaper Danehill (Danzig). He has five lines of Northern Dancer (Nearctic) in his background, two coming via Danehill and there’s no fewer than seven crosses of celebrated mare Natalma (Native Dancer). Ducimus will stand for an introductory service fee of $2,750 (inc GST) alongside Hvasstan and God Has Spoken at Rivercrest Park in the south-west of WA at Stratham. There are discounts for black-type mares and black-type producers plus limited Lifetime Breeding Right are also available. DUCIMUS (Snitzel). 2 wins at 2 at 1100m, $134,600, in 2016-17, VRC Talindert S., L, 2d ATC Pago Pago S., Gr 3, 4th MRC Vain S., Gr 3, MVRC Red Anchor S., Gr 3. TUSCAN SLING (Danehill Dancer (Ire)). 7 wins 955 to 1400m, $405,400, MRC Mannerism S., Gr 3, Geoffrey Bellmaine S., Gr 3, Christmas S., L, MVRC Jeep 55 Second Challenge Heat 1 H., 3d MRC Alinghi S., L.
Arrival (Choisir). 2 wins–1 at 2–to 1200m, 2d SAJC Pewsey Vale S., L.
KIWIA (Reset). 6 wins 1400 to 2400m, $442,650, to 2017-18, MRC Coongy H., Gr 3, Dream Thoroughbreds H., 2d Bendigo Cup, Gr 3. YEAR 1: Two nominations with upfront payment of $5,000 inc. GST at the beginning of the 2019 breeding season. YEAR 2: Two nominations with upfront payment of $5,000 inc. GST at the beginning of the 2020 breeding season. YEAR 3: Two nominations with upfront payment of $5,000 inc. GST at the beginning of the 2021 breeding season. 1) Mares that have placed 1st, 2nd or 3rd in a Black Type Race shall be entitled to a Nomination in the 2019 and 2020 Stud Seasons without payment of the Service Fee on the terms of the Stallion Service Fee Agreement. 2) Mares that have produced progeny that has placed 1st, 2nd or 3rd in a Black Type Race shall be eligible for a Nomination in the 2019 and 2020 Stud Seasons without payment of the Service Fee on the terms of Stallion Service Fee Agreement.